We’d love your help. 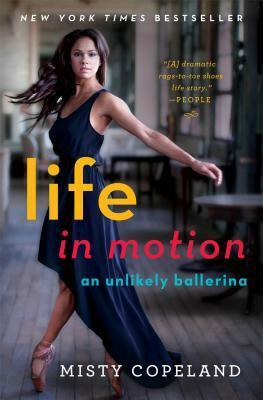 Let us know what’s wrong with this preview of Life in Motion by Misty Copeland. In this instant New York Times bestseller, Misty Copeland makes history, telling the story of her journey to become the first African-American principal ballerina at the prestigious American Ballet Theatre. But when she first placed her hands on the barre at an after-school community center, no one expected the undersized, underprivileged, and anxious thirteen-year-old to become one of America’s most groundbreaking dancers . A true prodigy, she was attempting in months roles that take most dancers years to master. But when Misty became caught between the control and comfort she found in the world of ballet and the harsh realities of her own life, she had to choose to embrace both her identity and her dreams, and find the courage to be one of a kind. To ask other readers questions about Life in Motion, please sign up. I am wondering from anyone that has read this book if it is appropriate for younger tween girls. My daughter is 11 and studying classical ballet and is interested in reading the book. I am wondering if there is any topics in the book that you would feel are not appropriate for a girl of 11? thanks. Jennifer This book is a flowing story that I couldn't put down, and I read it in a day. I think a smart 11 year old girl would learn a lot about life,…moreThis book is a flowing story that I couldn't put down, and I read it in a day. I think a smart 11 year old girl would learn a lot about life, self-discipline, families with emotional and stress challenges (Misty talks about her mom's multiple divorces and reasons why) and Misty's fortitude to master life's curveballs and continue to pursue ballet (the art-form, activity and sport to which Misty becomes committed). Misty talks about her experience of the ballet world as a technically skilled, artistically sensitive brown-skinned dancer and the prejudices she encounters in her career as a ballerina in an historically white-skinned occupation. In the book, what is her style? Life in Motion is the December 2016 group read in the group African American historical fiction. As the winter is a captivating time of year to watch ballet, we read about Misty Copeland, the first African American soloist for the New York City Ballet in many years time. Life in Motion, which she wrote with a collaborator, is her story of perseverance that lead her to become the ballerina she is today. Misty Copeland was born in St Louis, the fourth of five children. Her mother one day decided s Life in Motion is the December 2016 group read in the group African American historical fiction. As the winter is a captivating time of year to watch ballet, we read about Misty Copeland, the first African American soloist for the New York City Ballet in many years time. 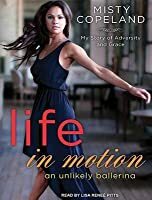 Life in Motion, which she wrote with a collaborator, is her story of perseverance that lead her to become the ballerina she is today. Misty Copeland was born in St Louis, the fourth of five children. Her mother one day decided she had enough of an abusive marriage and packed her children in a car and drove to California. At first the Copeland family lived in hotel rooms or one bedroom apartments while their mother sought out work. They survived on spaghetti-o's and kraft macaroni and cheese while living in tight quarters, becoming a close knit family. Copeland looks back fondly on these times because she survived but also for the family time spent watching football and becoming closer as a family. It was during one of these moves from hotel room to tiny apartment that Copeland discovered ballet at the Boys and Girls Club of America in suburban San Diego. Quickly identified as a dancer with immense talent, she emerged from this safe haven and went to dance at private studios. One of her teachers found out about her impoverished living conditions and brought her to live at her home so that she could live in a loving environment and focus on her dancing. While this created friction with her mother and siblings, it was for the best because Misty rose the ranks on the west coast, procuring scholarships to summer programs and eventually becoming a member of the New York City Ballet Company. A prestigious company like the New York City Ballet Company does not have many dancers of color in their rank. The few that make it experience prejudices and form a comradeship in order to ease their feeling of outsiderness in the company. Misty also sought comfort from mentors such as Raven Wikenson, one of the first dancers of color who paved the way so that Misty could be where she is today. Taking that advice to heart, Copeland remembered where she came from, giving back to and being honored by the Boys and Girls Club that gave her a start to her dance career. Life in Motion is the story of a dancer of color who has not had all the advantages that most prima ballerinas enjoy. It is the story of a dancer who came to the profession later than most and succeeded where many people of color drop out. Misty Copeland, the first African American soloist of the firebird for the New York City Ballet Company, is an inspiration to young dancers of color. While not the best written book, it is an endearing story of achieving the American dream through hard work, which I rate a solid 3.5 stars. i want to be very clear upfront -- i love (LOVE!) misty copeland. i think she is fierce, admirable and inspirational. this review is not about her or her life. this review is about the quality of the book. and the quality of the book for me was, unfortunately, not great. i didn't find the writing particularly strong, and i found the structure of the telling erratic and repetitive. so this is just such a shame. i have found that when people of note pen their memoirs (and sometimes they choose a co-author to help), it can make for a really bumpy reading experience. i end up feeling frustrated that these people, who are so, so strong in their fields, don't seem to apply the same determination and focus in creating a book that is fantastic. (recent disappointing memoirs i have read that fall into this area for me include Rocks: My Life in and out of Aerosmith and Slash - which both had co-authors.) i truly feel copeland's book could have been so much more. i did really enjoy the behind-the-scenes aspects of the book - misty's time at san francisco ballet's summer intensive, time with the ABT, and her classes in san pedro as a child. i would have loved even more of this, more time hearing about the classes and rehearsals, and the productions that were being created. as a former bunhead, these aspects of a dancer's life are fascinating to me. copeland's personal story is pretty messy. she and her siblings endured some tough, uncertain times, and a lot of chaos. that they have each (the kids) come through to be successful is a testament, i think, to the strength of character they all possess. one of the frustrations i felt in the book had to do with the issue of weight - this is a subject seen to be problematic in the dance world. rightly, or wrongly and outdated, a certain line or shape is required/desired for the more classic ballets. copeland repeatedly tells us that her body does not conform to the standard. she tells us about her curves and her breasts being viewed as problematic, right along with her skin colour. copeland touches briefly on bulimia and eating disorders. she presents dismay at dancers not being seen as healthy and strong - because many (most!!) have excellent eating habits, and ensure they are getting the foods and calories essential to keeping their bodies healthy and strong. and if you look at misty copeland, there is no doubt she is healthy and strong. so during the times she was so fixated on weight gain and trying to get her weight under control, i felt upset that it was running contrary to the message i feel she was trying to convey. at one point, copeland reveals she is a size 0. and yes, size 0 women can be curvy too. i know!! but i just felt like this part of her story only seemed to reinforce the unrealistic expectations put upon dancers. i wish she had used this platform, this opportunity, in a better way. so, while i am bummed this was not a stronger read for me, i think it will be a great book for many people. in particular, younger women/teenagers interested in dance, hoping to become ballerinas, feeling like it's an uphill battle. perhaps, actually, this book is suited to a younger reader? as i said, misty copeland is an inspirational woman. 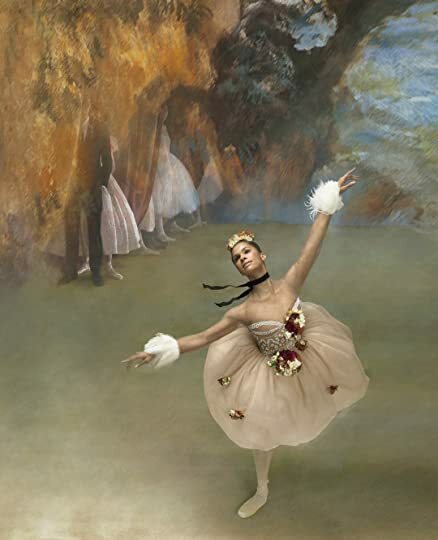 Misty Copeland made history in 2012 when she starred in Stravinsky's role of the Firebird in New York City as the first black soloist at ABT in more than twenty years. Her memoir is aptly named. Misty was a shy and introspective girl who grew up in a very unstable home and had a tumultuous childhood. Her family was constantly moving as her mother, a loving and well intending mother, moved from one troubled relationship to another. The family often struggled economically. Misty only discovers bal Misty Copeland made history in 2012 when she starred in Stravinsky's role of the Firebird in New York City as the first black soloist at ABT in more than twenty years. Her memoir is aptly named. Misty was a shy and introspective girl who grew up in a very unstable home and had a tumultuous childhood. Her family was constantly moving as her mother, a loving and well intending mother, moved from one troubled relationship to another. The family often struggled economically. Misty only discovers ballet in the sixth grade at the age of thirteen when her drill team coach recognizes her talent for dance and sends her to the Boys and Girls Club to meet a ballet teacher. Cindy Bradley instantly sees potential in Misty as Misty is able to learn skills in months that most students require years to master. Eventually, Misty even temporarily moves in with Cindy's family and gains self confidence and a new perspective on what she wants in life. Misty is asked to join ABT and does so after her high school graduation. During Misty's years at ABT she thrives but deals with many negative emotions as well. Misty is often frustrated with feelings of not fitting in the "white and wealthy world of ballet." She also deals with body image issues because her curvy body is not typical in ballet, but she ultimately finds acceptance and pride in her curvy physique. At one point Misty considers walking away from ABT to join Dance Theatre of Harlem but recognizes she would be following her mother's patterns and resolves to work harder than ever to gain the recognition she feels she deserves. Misty's story was incredibly touching and enlightening. I was most impressed with her deep desire to share ballet with an audience that might otherwise not be exposed to ballet. Her mantra is "this is for the little brown girls." Not everyone wants to push themselves to that brink of breaking, but it's what you commit to when you're a professional- the very present reality that you may break instead of bend. Since the publication of her memoir, Misty Copeland has achieved another first. In June of 2015, she became the first African American woman to be named a principal in the 75 year history of ABT. I had seen a documentary about Copeland a few years ago and her story intrigued me. This autobiography goes into much more detail about her childhood (there were so many things that could have given her an excuse to give up) and the struggles she faced as one of the only black ballerinas. It’s inspiring and awe inducing. It shows what hard work and dedication can do. This book is subtitled "An Unlikely Ballerina" but after reading it I'm not particularly convinced that the description really fits Misty Copeland. She seems intent on convincing the reader that she is an unlikely candidate to be a star ballerina because she is black, because she started dancing late and because she comes from a disadvantaged background. But this story line conflicts with the other dominant them in her autobiography, the one that insists on convincing us that she is phenomenally This book is subtitled "An Unlikely Ballerina" but after reading it I'm not particularly convinced that the description really fits Misty Copeland. She seems intent on convincing the reader that she is an unlikely candidate to be a star ballerina because she is black, because she started dancing late and because she comes from a disadvantaged background. But this story line conflicts with the other dominant them in her autobiography, the one that insists on convincing us that she is phenomenally talented and deserving of the accolades and success she has achieved. I am not arguing that Copeland is not talented or that she does not deserve to be in the position she has achieved. I find it hard to blend the proclamations of her talent that border on arrogance with the assertion that she had to struggle to achieve her place in the ballet world. It seems that from the moment she was discovered in the Boys and Girls Club her path to stardom was virtually laid out for her. She received support from key people, scholarships, invitations to summer intensives and prestigious ballet schools that any young ballerina would envy. Yet somehow she had to work harder to achieve this than others? I don't see it. I know many ballerinas who work just as hard with a fraction of the support or praise that she received and I don't hear them complaining. They just keep doing their best. I often found Copeland's self-praise as arrogant and excessive, such as when she writes regarding her first summer recital at ABT: "We were pretty much the stars of the program that summer." This may be true, but from the mouth of the dancer it comes across as arrogant. I believe that true talent doesn't need to sing its own praise, and Copeland certainly seems to get plenty of praise from others. I would have found her biography more appealing had she allowed those other voices to speak of her talent rather than to proclaim it so loudly herself. I also found Copeland to have a rather demeaning attitude toward a number of issues, in particular other dancers who are not like her. When she speaks of how well she felt she fit in on the streets of New York, she contrasts herself with "the frail-looking white dancers whom I danced beside." Yet she knows full-well how these "frail-looking" dancers are anything but frail. She knows the rigorous work they go through to be dancers. So why refer to them with this demeaning adjective? Many times throughout her biography I found myself reacting similarly to her use of adjectives and phrases. It seemed that in her desire to show how different she was from the "typical" ballerina she felt she had to diminish them through petty comments like these. This greatly disappointed me. Ballet as an art form has its origins in Italy as far back as 1489 when Bergonzio di Botta presented the first ballet dinner in Tortone. It wasn’t until nearly 200 years later when it took root in France with the establishment of the first ballet academy, Academie Royale de Danse, founded by Louis XIV. The very first professional female ballet dancer was Mlle. La Fontaine in 1661. This classical art didn’t make its way to America until the late 1700’s and it would be over 150 years after that be Ballet as an art form has its origins in Italy as far back as 1489 when Bergonzio di Botta presented the first ballet dinner in Tortone. It wasn’t until nearly 200 years later when it took root in France with the establishment of the first ballet academy, Academie Royale de Danse, founded by Louis XIV. The very first professional female ballet dancer was Mlle. La Fontaine in 1661. This classical art didn’t make its way to America until the late 1700’s and it would be over 150 years after that before we see the emergence of our first prima ballerina in Janet Collins and nearly 200 years before Lauren Anderson became the 1st black principal dancer at a major ballet company. What is striking about Misty Copeland is how quickly she attained her meteoric rise within this community. From her rather late start in the dance form, to her meager beginnings and enduring a very public custody battle, it seems as if the deck was stacked against her. But in her book Life in Motion, Misty tackles all these topics and more. At first she may come off a little overly confident to some, but as the book progresses so does Ms. Copeland’s voice. It gives a sense of her maturing along the way as she comes into her own and hones her craft. Along with watching A Ballerina’s Tale, I learned a lot about her struggle and have a much deeper appreciation for her accomplishments and contributions to the tradition of ballet as she opens more doors for brown girls who look like me and my daughter. That being said, Misty Copeland does not stand alone in this endeavor. Some of her contemporary sister Black Swans have been highlighted in this piece by Ayesha Faines. Like some reviewers I was struck by the tone of Misty's narrative. The way she talks about her skills is not particularly self-effacing. But I felt it was actually a positive aspect that she did not attempt to suggest that she is only one of many talented dancers who happened to luck out. The fact that she told her story unapologetically was a large part of the book's charm because frankly, readers will decide if they are curious about her story or not. And she does address critics a bit in the Like some reviewers I was struck by the tone of Misty's narrative. The way she talks about her skills is not particularly self-effacing. But I felt it was actually a positive aspect that she did not attempt to suggest that she is only one of many talented dancers who happened to luck out. The fact that she told her story unapologetically was a large part of the book's charm because frankly, readers will decide if they are curious about her story or not. And she does address critics a bit in the later portion of the book, I suspect the fact that her body is under constant scrutiny contributes to her proud tone because I am unsure that she could continue to thrive in dance if she didn't work to appreciate and speak about her own strengths. What surprised me was her openness about her family background as well as her honesty about how she felt about the various people involved. To do that at her age and at this point in her career was a definite risk but it provided a fairly uncensored view of the humanity behind the perfection associated with a ballet dancer. So many artists never allow a glimpse at the difficulties they work through which is a real detriment for those whose challenges make quitting a more sane option than pushing through. I felt that her tone reflected this necessity to connect with others whose background is prohibitive to a dancer's life but who could benefit greatly from the discipline of the dancing experience. Misty Copeland took her first ballet class at a Boys and Girls Club in San Pedro, California at the age of 13. One of six children, she never knew her biological father before she was 20 years old. Her family lived in a motel for many years. Misty was a young African American girl who had never even seen a ballet performed, but she had incredible talent and strong passion to express herself fully as a ballerina. By age 19 she was living across the country in New York City as a member of the Amer Misty Copeland took her first ballet class at a Boys and Girls Club in San Pedro, California at the age of 13. One of six children, she never knew her biological father before she was 20 years old. Her family lived in a motel for many years. Misty was a young African American girl who had never even seen a ballet performed, but she had incredible talent and strong passion to express herself fully as a ballerina. By age 19 she was living across the country in New York City as a member of the American Ballet Theatre (ABT). Unlike many “traditional ballerinas,” Misty is brown and her figure is un-waif-like. While some in the dance world felt that she wasn’t the ideal representative of the history and discipline of ballet, she became a muse and performer with contemporary powerhouse musician Prince. In 2007 Misty Copeland made history as only the third African American female soloist and the first in 20 years to dance an iconic role, "The Firebird,", with ABT. Many earthbound “angels” have accompanied her along the way, but this book is her story of “Adversity and Grace”. I became aware of Misty Copeland after seeing her on a television broadcast of“Black Girls Rock!” last year. When I learned that my niece was a fan of hers, I bought two copies of the book so we could read it, together---a cool experience! This book bridges more than generations. I loved it for its honesty, inspiration, and balance. Copeland comes across as real and credible. As an artist she is incredibly talented, disciplined, and expressive; yet she also comes across as a human being with vulnerabilities and a unique voice and story. Her narrative is interesting for those in the performing arts, but also important and inspiring for everyone---especially “little brown girls” everywhere who are built of a strength and passionate desire to do and be things that “traditional” and “mainstream” culture would exclude them from forever. I couldn't be happier to win this book in a Goodreads giveaway. I trained in and performed ballet seriously for ten years myself and now continue to enjoy it for fun. 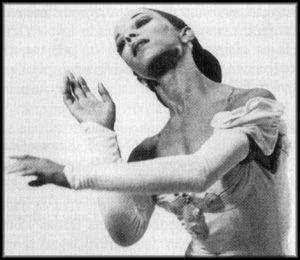 Misty's memoir traces her unlikely path to becoming a soloist with the American Ballet Theater (some argue the best ballet company in the US) and one of the first African American women to do so. She had unimaginable beginnings learning ballet at a Boys and Girls Club at the late age of thirteen along with an unstable childhood liv I couldn't be happier to win this book in a Goodreads giveaway. I trained in and performed ballet seriously for ten years myself and now continue to enjoy it for fun. 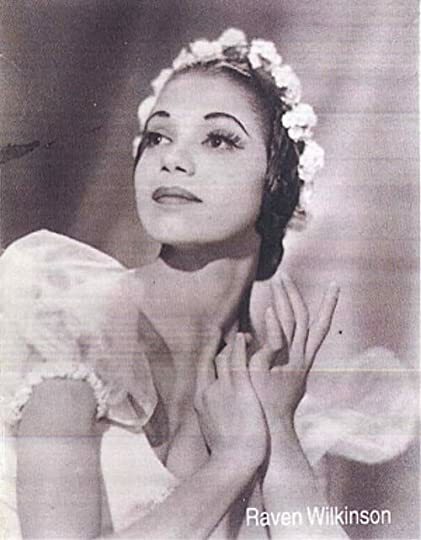 Misty's memoir traces her unlikely path to becoming a soloist with the American Ballet Theater (some argue the best ballet company in the US) and one of the first African American women to do so. She had unimaginable beginnings learning ballet at a Boys and Girls Club at the late age of thirteen along with an unstable childhood living in a motel with her siblings and mother. She worked incredibly hard at her craft and soon was attending summer intensives at the best ballet schools. Not long after high school, she had a spot within ABT. I'm torn about whether or not I liked this book. On the one hand: Misty Copeland's story is inspiring. It's amazing what she went through before becoming (currently) the only African American soloist dancing with ABT. Even as a ballet prodigy, her upbringing made it so that the odds were overwhelmingly stacked against her. Not only did Misty overcome them, she never made an excuse to stop trying. Like I said, inspiring. On the other hand: I understand that she still currently works with ABT, but a I'm torn about whether or not I liked this book. On the other hand: I understand that she still currently works with ABT, but at times it felt like she would state her truth and then backpedal. She repeated over and over again how thankful she is, how wonderful everyone in the company is, etc. I understand that, but it's just a bit odd to throw that in constantly in between talking about how she struggled to rise to the top because of her race. That's why I was so confused when she said "Even I have to admit that there have been times when I sat in the audience and, seeing a dancer with a particularly tiny head, thought to myself that from the seats down below, she looked odd and out of sync." Does she seriously mean this, or is she trying to legitimize some of the discrimination in ballet so as not to seem too accusatory to ABT or the rest of the ballet community when she talks about struggling with race? As a feminist, I also couldn't understand why she had to try to legitimize street harassment. I understand that she loves New York, but I really could have done without the page that talked about how "At first, [street harassment was] unnerving. I was living alone in the city, and it made me feel vulnerable having strange men leering at me. But after a while, I began to realize they were mostly harmless and good-natured. You might draw some attitude if you acted snooty. But if you smiled, or said hello, the calls would usually go no further than flirting, ending with 'Have a good day.'" Uh, no. I refuse to believe that "drawing attitude" happens because I have "acted snooty". Harassment isn't deserved. The only other thing that I really struggled with was the timeline of the book. It bounced around a lot, and at times it was a bit hard to keep track of what happened when. Misty had an itinerant childhood, moving whenever her mother changed boyfriends. She was born in Kansas City, Missouri, but moved to California when her mother left her father. Misty had always loved to dance, and when she was 13, she was told she should try ballet. She was a quick learner and was soon called a prodigy. Her home life was unsteady — at one point the whole family was living in a motel — and when Misty's mom said she had to give up ballet, Misty's dance teacher asked Misty to come live with her. Misty lived with her teacher for several years and studied ballet intensively, but her mother eventually demanded she return home. The battle for custody created a media storm. The incident was very distressing to Misty, who had always been an anxious child. Misty moved to New York after auditioning for the ABT program, and she became a member of their company in 2000. Misty wrote that being a minority woman in ABT could be challenging, and at one point was so frustrated with the lack of opportunities for African American dancers that she considered leaving ABT. But she stayed, and she ended up making ballet history. Conclusion: At least she can be a prima donne, if not a prima ballerina. Ohhh snap. 1. She truly had to endure a lot of things as a child. I respect her drive and her perseverance. 2. There's a few things I didn't like, though. She kind of put people down in tiny ways that just seemed rude. She said that her drill teammates were "fast", she called one girls performance forgettable, called ABT's white dancers "frail," and I also didn't like that she kept saying brown girls. I understand the thing Conclusion: At least she can be a prima donne, if not a prima ballerina. Ohhh snap. 2. There's a few things I didn't like, though. She kind of put people down in tiny ways that just seemed rude. She said that her drill teammates were "fast", she called one girls performance forgettable, called ABT's white dancers "frail," and I also didn't like that she kept saying brown girls. I understand the things she had to go through but every person, no matter what skin color, goes through heartbreak and loss. Just because I'm white doesn't mean I haven't felt what it was like to be bullied or told no. 3. She's beautiful. I watched YouTube videos of her Under Armour campaign and was mesmerized. 5. It feels like she keeps attaching being white to being rich. I'm white. Never have been rich. She discusses all of her friends and how they are all these different races and mixed, but she doesn't ever talk about being friends with any of those "white rich" kids. She even alludes to their snobbiness. But, I'm sorry, she is the one who seems snobby to me. 6. I keep critiquing this book and then go back to positive things. Such as, this was a page turner and I sometimes forgot I was reading non-fiction. 7. Her rant about having to paint herself white for some ballets. Isn't the Harlem ballet doing the same thing but in reverse. They prioritize African Americans. If there was an advertised ballet of prioritized white people, it would be considered racist. She's a successful dancer in a prestigious dance company. I'm seeing a pattern with her behavior. She has sort of bitten a lot of the hands that have fed her. She criticized the Bradley's, her mommy, and ABT. I read Michaela DePrince's memoir and while she addressed the whiteness of ballet, I didn't get the same vibe that Misty is throwing out. Michaela was humble, sweet, and grateful. 8. And the girl who told her the article was stupid. She called her insensitive. That's not how I took the comment at all. I took it as her saying it was stupid because, of course they accepted Misty. Of course, they saw her as their peer. But Misty admittedly hung out with the black dancers, isolating herself. 9. I really do love this book. I love learning about dancers and what drives ballerinas, but Misty is really getting on my nerves. 10. Also, Misty is the one who keeps pointing out everyone's ethnic backgrounds. We are all people. Moving on. 11. She's a prodigy everyone. Just so you know. 12. Did she use obscure vocabulary just to seem smart? Scion, chanteuse. Just say descendant and singer. Come on. 13. Has she always had a private patron paying for her things? She probably has more support than a lot of the dancers. 14. Maybe she felt alone all the time because she isolated herself and wasn't a very nice person. 15. She's clearly still peeved that The New York City Ballet intensive program didn't accept her. 17. So, Arthur from Dance Theatre of Harlem, a "burning spirit" is only within black people? Interesting. 19. It was very hard for me to find the Prince video. It was trippy. 20. Speaking about touring with Prince, "I'm sure there was a dramatic write-up about it and possibly a lawsuit involved, which happens with such things." Oh, does it? 21. "The dress was a size four. I was barely a size zero." The dress was too heavy. The stage wasn't right. The choreography was too simple for me. OMG. You are dancing for Prince. 22. I guess she only dances for the little brown girls. Sorry, every other little girl. She's not dancing for you. 23. I think it's weird that this book had an index. The first ballet I saw was probably a production of The Nutcracker at the local community center in my hometown. Since then I have been fascinated, intrigued, and completely mesmerized by dance. There is something magical about men and woman flying through the air, and dancing on their tiptoes and telling a story without saying a word. When I lived in New York I tried to see as many ballets as my time and money would afford. Several years after leaving New York, attending a performance at Lincol The first ballet I saw was probably a production of The Nutcracker at the local community center in my hometown. Since then I have been fascinated, intrigued, and completely mesmerized by dance. There is something magical about men and woman flying through the air, and dancing on their tiptoes and telling a story without saying a word. When I lived in New York I tried to see as many ballets as my time and money would afford. Several years after leaving New York, attending a performance at Lincoln Center is still one of the things I miss most about the city. So when I heard that Misty Copeland was publishing a memoir/biography I was thrilled. First, she is a wonderful dancer. Second, as a soloist at the American Ballet Theatre she is one of the very few African-American women to have ever made it to this level at a major ballet company. Copeland has an interesting story to tell. Her background doesn't quite fit the mold of a typical ballet dancer. For starters, she began dancing relatively late at the ripe old age of 13 and her first class was at a Boys and Girl Club. In Life in Motion Copeland tells how she went from dancing at a gym at a Boys and Girls Club to the stage at Lincoln Center's Metropolitan Opera House. In addition to her personal story, Copeland provides a glimpse of what it takes to be a dancer - the daily regimen of class and rehearsals, the injuries, and even the politics of the ballet world. Notwithstanding my love of the ballet, I have to admit I don't know much about its history so I was particularly interested in the bits about other dancers of color who preceded Copeland (now I have homework to do) and the inner workings of a ballet company. Misty Copeland, star ballerina with the American Ballet Theatre, wants us to know that when she enters a stage, she thinks, “This is for all the little brown girls.” And rightfully so. She is the first Black ballerina to rise to this level of prominence in twenty years, and the first ever to star in The Firebird. I read this book free courtesy of Net Galley. I approached it not as a fan of ballet, but as an avid reader of autobiographies and memoirs. When I rate this book a five-star read, I do so not for a niche audience, but for anyone who enjoys reading stories of personal struggle, triumph, and success. Copeland, who is racially mixed but identifies primarily as African-American, is famed for her work on the stage, but she can really write, too. I kept half an eye open to see if a byline or as-told-to would crop up somewhere. Copeland’s education was often disrupted by a chaotic childhood; her mother, a loving but apparently capricious individual who seems to have had terrible taste in men, had trouble staying in one place. Dramatic departures that took all of Misty’s “tribe” (her loving term for her siblings) in as co-conspirators, became a pattern, but they never seemed to leave the first “daddy” until Mama had a second one already waiting for them. How does a young woman whose life—and education—are tossed up and thrown down into increasingly tenuous situations , become this literate? I can only conclude that the label of “prodigy”, one she heard from an early age, did not apply solely to her dancing talent, but also to her intellect and capacity to pick up information quickly. Copeland begins her ballet training in California, in a working class neighborhood at the local Boys and Girls Club. Her ability is breathtaking, and a mentor arranges for her to receive further, more advanced training. At one critical juncture, Copeland’s mother pulls another rip-up-our-roots-and-leave number, and the family, now nearly destitute, lands in a motel room in a seedy area. There are six children and their parent (and boyfriend, at first) living in a single room, and Misty survives emotionally by compartmentalizing her life, fronting at school as if her home is the same as everyone else’s, avoiding prurient details, and doing the same, more or less, at her beloved ballet lessons. (Her mentor is covering some expenses for her, but she does not know this at the time; she thinks it is all free.) Misty ‘s sisters and brothers are increasingly finding other places to spend the night; the integrity of the family is unraveling. Misty survives those nights in the grungy motel by looking forward to school and above all, ballet, the following day. That is, until her mother tells her to quit. Turns out, it isn’t so bad that way. Life in the middle class opens up new possibilities for her, once she is in Cindy’s condo with her husband and toddler. She learns which fork to use, how to set a good table, and watches ballet on video. She has nice clothes and a full belly. Her confidence increases. After years in the bosom of a new and loving family, in which she is included to the extent of having studio portraits of a family of four framed on the walls, herself, the two new (Caucasian, Jewish) parents, and the little brother, her mother decides to take her back. This reviewer has been there, and nearly wept at this juncture, though the author puts a professionally polished distance between the feelings she had then; those she had subsequently; and those she has now. Social workers will tell you that a parent who is more than ready to see a child go, a kid who is one more mouth to feed at least, and at times, maybe creates extra work or trouble, often sees their newly-acclimated offspring when they are successful and happy, and they suddenly want them back, as if they can pull a little piece of that success back to themselves. Maybe that’s what occurred here. Perhaps other, less subjective reviewers may feel differently, but I was surprised to see Cindy wiped out of the story, more or less, once Misty went back to live in the motel, and then not brought back except peripherally at the end. I get it; this is a ballet memoir, but it’s also an autobiography, and when she tells us that she had “been seeing” Cindy and her family off and on, I wondered what kind of interactions took place, and whether she felt turmoil at such times. One thing was sure, though: just as she took to ballet with remarkable speed and talent, she also took to Manhattan in a New York minute. Though it was expensive and hard to afford an apartment with any natural light or air, she hooked into the city, once invited to study, then perform there, and claimed it as her own. At one point in her development as a ballerina, when a bigoted reviewer indicates that she doesn’t fit in with the white dancers, members of the Harlem cultural community ask her why she doesn’t come there to dance instead. Why does she put herself through it, they wonder. And in time, she is formally invited to jump ship and come on board the Harlem dance organization. But she has learned the negative lessons of her mother’s tendency to cut and run when adversity strikes, and she decides she will fight to maintain her position in the USA’s premier ballet company. International fame follows, along with the opportunity to work with the musician Prince. And there is more, but I should leave a thing or two for the reader to discover. I appreciated the author’s deft juggling of her personal story and her professional one, although of course they mesh in many places. There is never a point where the story drags or too much information (old grudges or love life details) make me want to skim. Like the ballet, the story is lean, trim, and full of joy, despite hardship. You should read it. I finished this book a while ago and kept forgetting to review it. This book tells the story of misty Copelands life as a ballerina. the beginning was kind of confusing but through out the rest of it wasn't. This book is really good and I would recommend it to people if they need to read a biography. You should totally read this book by Misty Copeland, a barrier-shattering African American classical ballerina, but even more than that, you should type her name into YouTube and see for yourself what she can do. Because she is ridiculously, insanely talented, and there's no way to fully comprehend the magnitude of it unless you see it with your own eyes. And OH MY GOSH it has not been an easy climb to the top. Breaking into the lily-white world of professional ballet has been a struggle since C You should totally read this book by Misty Copeland, a barrier-shattering African American classical ballerina, but even more than that, you should type her name into YouTube and see for yourself what she can do. Because she is ridiculously, insanely talented, and there's no way to fully comprehend the magnitude of it unless you see it with your own eyes. And OH MY GOSH it has not been an easy climb to the top. Breaking into the lily-white world of professional ballet has been a struggle since Copeland first donned a pair of pointe shoes at the Boys and Girls Club when she was 13. She's been asked all the insensitive questions you can imagine. She's been passed up for roles. She's been told to lose weight, to powder her face so she appears lighter-complected onstage. She's been encouraged to pursue modern dance because she doesn't fit the mold for classical ballet. And she's now a principal dancer with American Ballet Theatre, one of the most prestigious dance companies in the world. You can see why the slogan for her Under Armour ad campaign is “I will what I want,” no? Also, if you're interested: there's a great documentary about Copeland (A Ballerina's Tale, available on Netflix) that overlaps somewhat with the book but also covers a lot that the book doesn't. Plus, of course, it includes plenty of footage of her dancing. I have been interested in ballet since I was 12 and after seeing A Ballerina's Life last weekend, I needed to read this. I am now obsessed with Misty Copeland. This book was so uneven. I really wish it would have been more about the ballet instead of her bumpy family life. Also, I REALLY really wish they would have hired a reader for the audio book who knew the difference between aUtistic and aRtistic. The first time she said it, I thought, Oh - that's a real accomplishment for that ballet director to be autisic, but when everyone was autistic, I realized she meant ARTistic. Sigh. Seriously, where was the editor on this? She wasn't even close and she h This book was so uneven. I really wish it would have been more about the ballet instead of her bumpy family life. Also, I REALLY really wish they would have hired a reader for the audio book who knew the difference between aUtistic and aRtistic. The first time she said it, I thought, Oh - that's a real accomplishment for that ballet director to be autisic, but when everyone was autistic, I realized she meant ARTistic. Sigh. Seriously, where was the editor on this? She wasn't even close and she had Rs in other words. Not sure how this got past the sensors. Kinda wecked it for me...ah sorry, I meant wrecked. I would also like to point out another uneveness. Misty claimed that ABT told her at one point that she needed to "lengthen" - which is ballet speak for loose weight. Then in the next breath, she claims she was never discriminated against because she was "fat." Um hello? Really? You just said they told you to loose weight "or else." I'm puzzled. And can I please point out that Misty went up one side and down the other about how painful it was that she was discriminated against because she was black, but that it was ok for dancers to be cut because their heads were too big or their hips to wide. Um...those are just as biological as skin color and they have no bearing on talent. Luckily, my talents lie elsewhere, b/c I'd have to be dead for 4 years before even considering being small enough to be a dancer. I get that race has always been a big issue, but I guess fat people are just lazy right? Ok, I'm going to stop b/c I'm gonna get rowdy if I keep going. This book had a lot of promise, but it was mostly disappointing and whiny. On June 30, 2015, Copeland became the first African American woman to be promoted to principal dancer in the American Ballet Theatre's 75-year history. after being named one of the 100 most influential people in the world by Time the prior month. When I heard the news, I immediately ordered this book from the library, and read it straight through in an afternoon. If I were still teaching, this book would enter the curriculum for biography/memoir in middle school. The style of writing is so warm a On June 30, 2015, Copeland became the first African American woman to be promoted to principal dancer in the American Ballet Theatre's 75-year history. after being named one of the 100 most influential people in the world by Time the prior month. When I heard the news, I immediately ordered this book from the library, and read it straight through in an afternoon. If I were still teaching, this book would enter the curriculum for biography/memoir in middle school. The style of writing is so warm and personal; it's as if Misty herself were talking to the reader. The story of her early life is simply unbelievable, as her mother constantly moved her five children from man to man, place to place. I have to give Misty credit for forgiving her mother, but as a reader, I find that women to be reprehensible. It's to Misty's credit that all her adversities--whether from family or injury--were met with strength and courage. The last section deals with an injury that sidelines her for months, right after her glowing debut as the Firebird. But it didn't defeat her, and her promotion to principal ballerina just last month is proof of her unflagging devotion to ballet and to excellence. She's also lots of fun :-) Some of the most upbeat parts of the book deal with her performing with Prince--she enjoys contemporary dance as well as the classical ballet, and it shows. I really enjoyed reading Misty Copeland's inspirational story. The writing was good and I felt that I was able to really learn something about her. There isn't much that's sensational here -- no crazy bouts with drugs or stints in rehab, like in many memoirs -- and the struggles she does mention aren't dwelled on. Copeland admits to having had struggles in getting to where she is today without blaming them for anything. I admire her strength and perseverance, as well as her drive and passion for I really enjoyed reading Misty Copeland's inspirational story. The writing was good and I felt that I was able to really learn something about her. There isn't much that's sensational here -- no crazy bouts with drugs or stints in rehab, like in many memoirs -- and the struggles she does mention aren't dwelled on. Copeland admits to having had struggles in getting to where she is today without blaming them for anything. I admire her strength and perseverance, as well as her drive and passion for what she does. Her story reminds us that we can achieve our dreams if we keep trying and refuse to give in to the negativity around us. Copeland was incredibly lucky to have the opportunities she did and to be surrounded by so many people who believed in her from the start, and I got the impression that she knows just how lucky she is. While her skill and natural abilities have propelled her to the top, her family and teachers helped her get started on that path, which is almost as important. So the whole of the book does not flow, the narration felt choppy and Misty jumps around in the timeline a lot. What I will say is the last chapter is beautiful and exactly how I feel. Ballet should be brought to everyone, no matter race, income, or body type. Misty Copeland may not be a writer, and some may say things about her dancing, but she is doing amazing things for ballet, and for that I respect her so much.